Have a Teenage Mutant Ninja Turtles fan in the house? 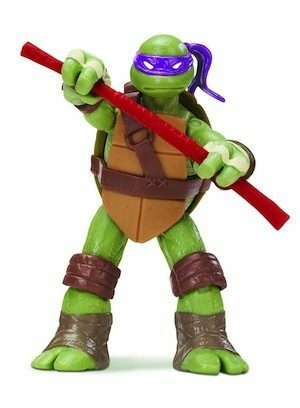 Get the Teenage Mutant Ninja Turtles Donatello or Teenage Mutant Ninja Turtles Michelangelo figures for only $6.74 on Amazon (reg. $11.99)! Super Saver Shipping will be FREE with an order of $35 or more or get FREE 2-day shipping with Amazon Prime. With more than 12 points of articulation, these action figures are the most highly detailed and articulated Turtle figures ever made. Each Turtle figure is uniquely sculpted, with heights ranging from 4.25″ to 5.25″, to capture the individual personalities of the characters from Nickelodeon’s Teenage Mutant Ninja Turtles TV show. Each Turtle is wearing his signature bandana and comes packed with their two core Ninja weapons and added weapons rack for hours of Ninja playing excitement.